Surrounding Mount Egmont, a perfect cone-shaped volcanic peak, and Egmont National Park, Taranaki is located on the North Island’s west coast. About 5 hours’ drive from either Wellington or Auckland, the Taranaki region is rather isolated. However, it boasts a surprisingly dynamic cultural scene around its only city, New Plymouth (74,000 inhabitants, or just over 50% of the region’s population). According to Māori legend, Mount Taranaki (or Mount Egmont) was a mountain god who lived alongside the North Island’s three other main mountains (Ruapehu, Tongariro and Ngaruhoe) in nowadays’ Tongariro National Park. Taranaki fought over the heart of pretty femal mountain Pihanga with Tongariro and, losing the battle, found himself banished to the west coast, creating the Whanganui River in its wake. A near-perfect cone, Mount Taranaki is still active, and his last eruption dates back to the mid-18th century. 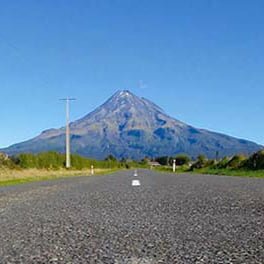 Towering the region with its 2,518m/8,261ft peak, Mount Taranaki has commanding view over the extension national park and is the setting of exceptional hiking trips. Populated by several Māori tribes since the 13th century due to its proximity to the sea, but also its exceptionally rich, fertile volcanic soil, Taranaki saw European settlement as early as the 1840s, for the same reasons. The region is today one of the country’s largest dairy hubs, and the second biggest milk treatment complex in the Southern hemisphere. Taranaki offers a whole range of lifestyle activities. Housing is relatively more affordable than other region in New Zealand, and comes in a variety of options, from very rural batches to urban-style apartments in New Plymouth. As mentioned above, the region, despite its relative small size, offers a whole array of outdoor activities, but also cultural options such as art galleries -including a world-class contemporary art museum-, and music festivals. The extensive coast has just as many rugged cliffs as beautiful sandy beaches, with boating, fishing, and swimming opportunities, and exceptional surf spots. A rather humid and windy region, it is nevertheless relatively mild, with temperature overing around 12-14C in winter and 22C in summer. 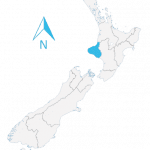 Taranaki jobs in agriculture are numerous and account for over 15% of the region’s employment. However, the region is also New Zealand’s energy province, with 90% of the industry’s employment nationwide. Several gas and oil fields (with reserves onshore and offshore) dot the bight and offer not only skilled positions but also investment opportunities. Also worth mentioning is a budding creative and tourism sector with opportunities to stand out from the crowd.